I really have a deep love for teaching. There is something about watching the "lights come on" in people's minds. Their faces light up, they get excited about what they are learning and you can feel the electricity when they engage. I got my start as an instructor while working in banking. After being noticed for my skills with Excel, I was asked to teach. Some time later, I was asked to become a technical instructor at the school I was attending. 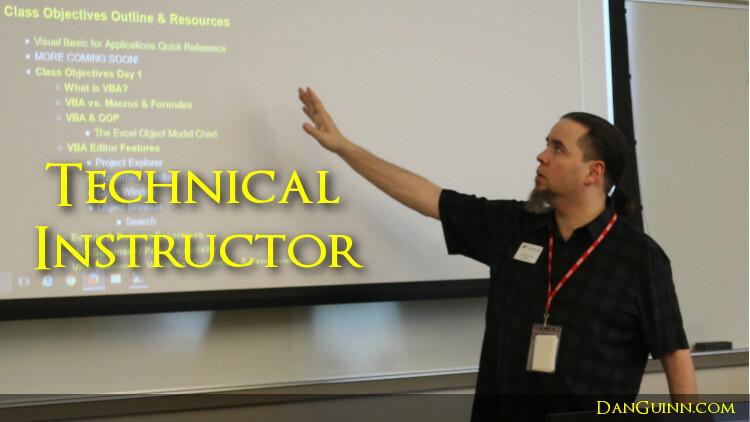 Today, I teach as a technical instuctor at Johnson County Community College. Training is an essential part of work. People need patient and yet engaging mentors. This is what I bring to the table. More about classes at Johnson County Community College and my previous teaching history. Classes Teaching at JCCC (2016 to present): All classes listed here represent curriculum developed for teaching by Dan Guinn, with book materials furnished by JCCC and additional supplemental materials developed by Dan Guinn. "I Clicked on the Internet - A humorous guide to understanding the internet and ministry." "The Top 5 Things You Need to Go Global - A workshop on resources for web ministry."